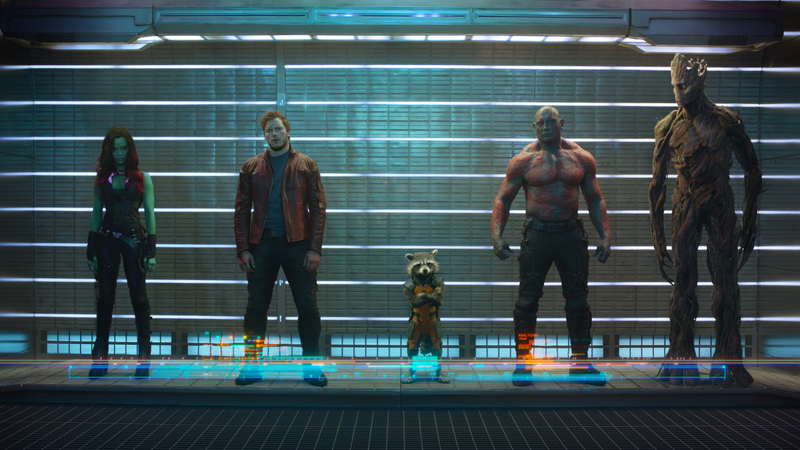 Big news for Guardians of the Galaxy, which seems to be quickly turning into one of Marvel's best-reviewed films yet (further cementing my personal hopes that Chris Pratt will one day rule the world and french braid my hair): In addition to getting great reviews, its box office prospects are looking hugely promising. According to Uproxx, Guardians of the Galaxy has opened to the biggest Thursday box office of the year, earning a total of $11.2 million in showings last night alone. The previous top spot-holder was another Marvel film that did not star Chris Pratt, Captain America: The Winter Soldier. Variety had more info about the film's huge opening: Guardians of the Galaxy is also on track to be the biggest August opening in film history, with projected earnings looking to be about $75 million this weekend alone, possibly more. The Bourne Ultimatum, which currently holds that spot, opened in 2007 to a total of $69.3 million. I honestly have no doubts the film will manage to beat that record. The reviews and buzz coming from posts like this one about the movie will likely usher people to theaters who may have been willing to wait before, and word of mouth about how great the film is will only bring more audience. If you do go this weekend, remember — stay until the end of the credits!